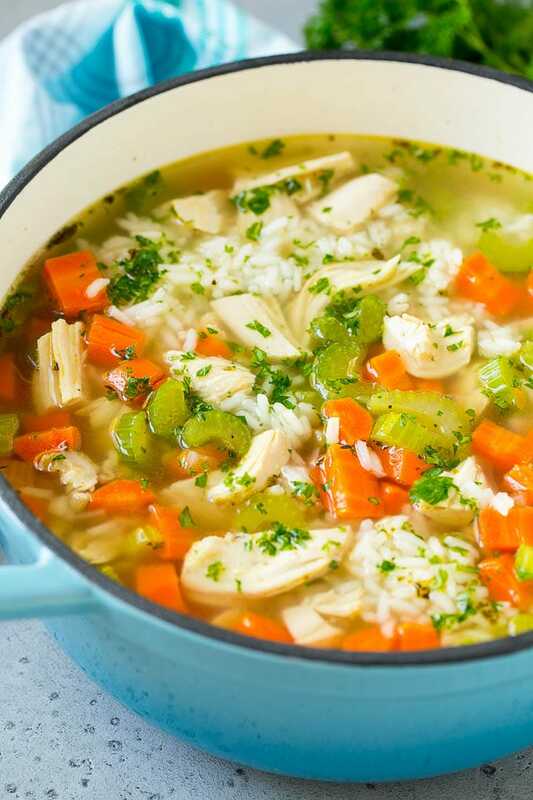 This chicken and rice soup is chicken breast pieces simmered with vegetables and rice in an herb broth. A quick and easy dinner option that’s comfort food at its finest! Some recipes are just classic, like salisbury steak and mac and cheese. 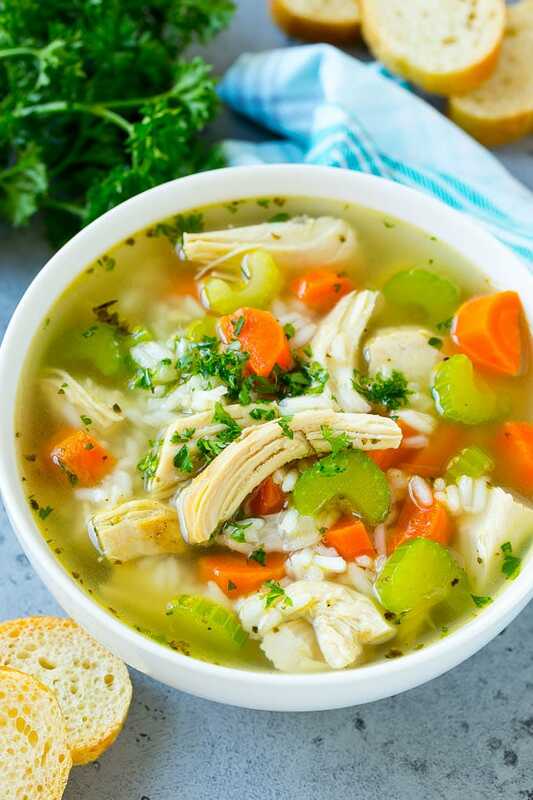 Chicken and rice soup is also on the list, and this is the perfect meal for cold weather or a sick day. Growing up, I used to eat chicken and rice soup from a can, especially when I was feeling under the weather. This homemade chicken and rice soup is ten million times better than the canned version and also happens to be super easy to make. How do you make chicken and rice soup? The ingredient list for this soup is simple and wholesome. 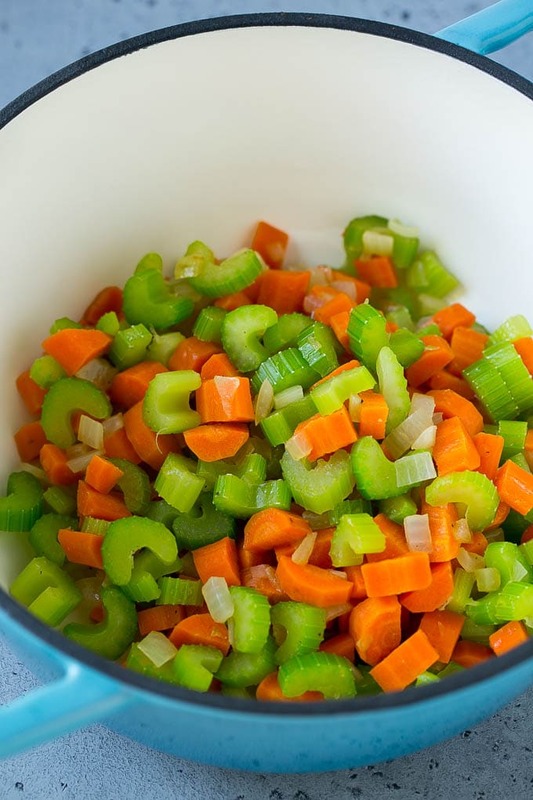 The recipe starts with carrots, onion and celery sauteed in butter. Shredded chicken, herbs and chicken broth go into the mix, then everything simmers until the veggies are tender. The final addition is the rice and a sprinkling of fresh parsley. 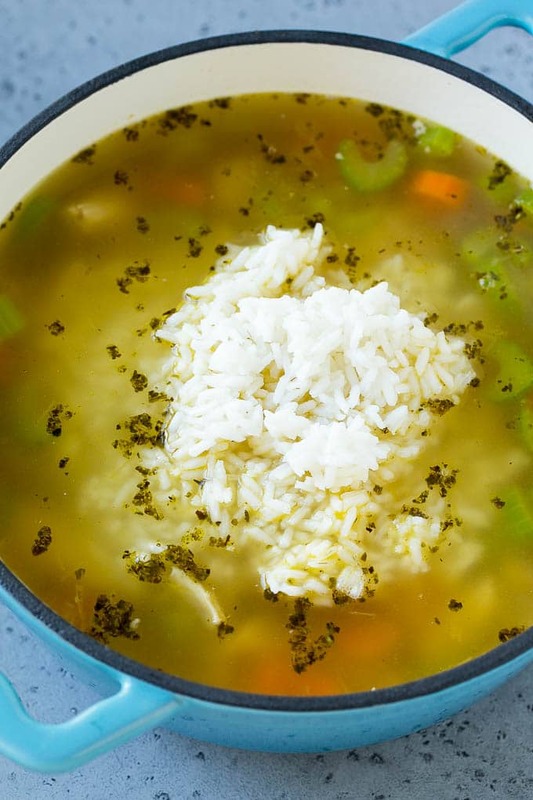 I typically use regular long grain white rice for this soup, because that’s what my kids like. You can also use brown rice or a wild rice blend if you prefer. Just be aware that brown rice and wild rice will need more time to cook, so plan accordingly! I typically roast up a few bone-in, skin on chicken breasts to use in this recipe. You can also use chicken thighs, leftover chicken, or even rotisserie chicken. This recipe calls for dried Italian seasoning, which is a blend of herbs such as basil, parsley and oregano. It’s readily available in most grocery stores. If you don’t have Italian seasoning, you can mix together equal parts of dried parsley, oregano and basil, or try using fresh herbs such as 2 teaspoons of chopped thyme leaves. Chicken and rice soup can be made ahead of time. Prepare the recipe as directed, but omit the rice. Refrigerate the soup for up to 3 days or freeze it for up to 1 month. Add the rice into the soup after the soup has been reheated. I typically use low sodium chicken broth so that the end product isn’t overly salty. This soup is hearty enough to be a complete meal, but I often serve it with bread on the side, like garlic knots or honey cornbread. Do you cook rice before adding it to soup? I prefer to cook my rice before I add it to this soup because rice is notorious for absorbing a ton of liquid and can easily get overly soft. If you stir already cooked rice into the soup right before serving, the rice will absorb very little liquid and won’t be mushy. You can absolutely cook the rice in the soup too if you prefer, just add a few more cups of broth to compensate for the liquid that the rice will absorb as it cooks. This soup is a great candidate for the crock pot. 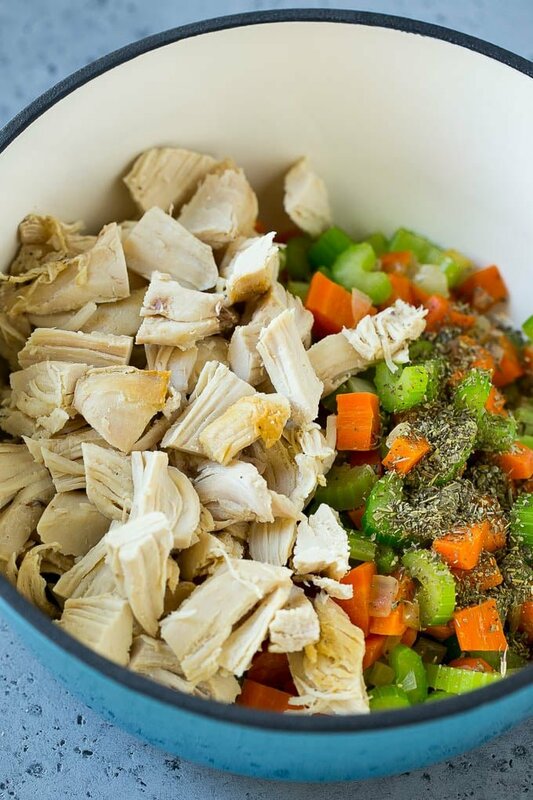 Place 4 raw chicken breasts in a slow cooker along with the veggies, broth and seasonings. Cook on low for 6-8 hours, then remove the chicken breasts and shred the meat. Return the chicken to the pot and stir in the cooked rice. Alternatively, you can add raw rice during the last 30 minutes of the cook time. 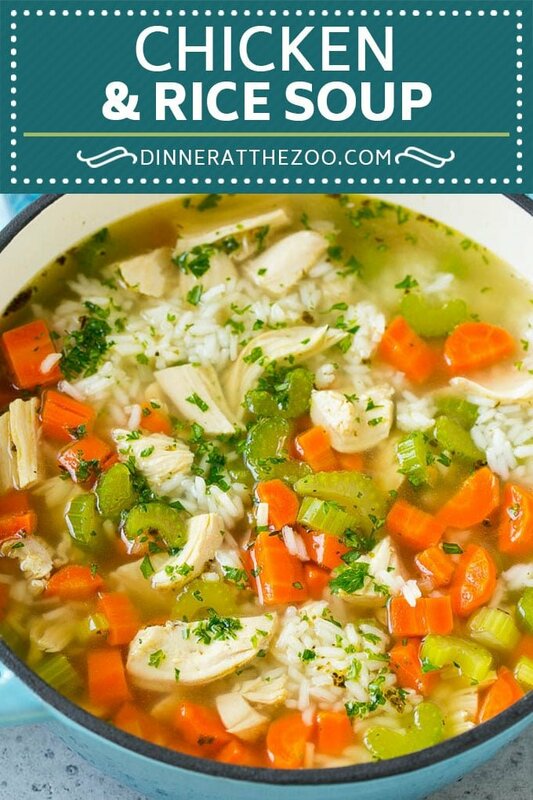 Whether you’re under the weather or just looking for a kid-friendly dinner option, this chicken and rice soup is sure to hit the spot! Add the garlic to the pot and cook for 30 seconds. Add the chicken, Italian seasoning, salt, pepper and chicken broth. Bring to a simmer. Cook for 10-15 minutes or until vegetables are tender. Stir in the rice. Cook for 5 minutes. Sprinkle with parsley, then serve. I love Chicken and Rice Soup! It’s really tasty! i hope I can try cooking your recipe. Yummy! This soup looks like it would be so comforting! I have not had a good homemade soup in a long time and this looks so delicious! It’s icy and cold here and I’m bundled up under the blankets with the pets. This soup would be the perfect addition right now. This soup looks so comforting to have on a really cold winter day. I am saving the recipe and making this for my family to enjoy tomorrow. My kids will thank you for the recipe. Chicken & Rice soup has been on my favourite list for long.Your presentation,easy to follow recipe & pictures of dishes are so nice. This soup seems like the perfect bowl for the warsh hinters we’ve been having in my city lately! I love how there’s tons of rice in the bowl. That soup is just loaded with goodness. I would love to have some of that right now. We have 1/2″ of ice covering our part of the world here! Chicken rice and soup is the food for the soul in cold winters. We can never have enough of it especially when we are travelling and have to cook our own meals. 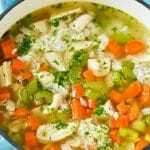 Chiken and rice soup is my favorite dish when its getting cold outside or I have a cold, and I love to put carrots and celery in it to add more flavor. Thank you for sharing your recipe. 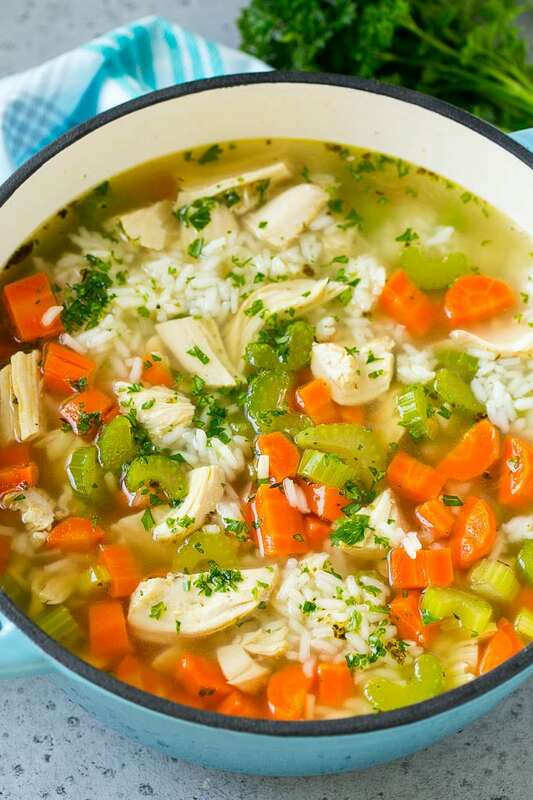 Chicken and rice soup is one of my favorite things to make when the weather gets cold or my kids are sick. It just hits the spot.